Camelot, a shining time of promise led by John F. Kennedy, the nation’s youngest president brought to an abrupt and bloody end in 1963. While conspiracy theorists debate who pulled the trigger, there’s another culprit that often goes unmentioned: Kennedy’s lifelong struggle with back pain. It was his habit of wearing a tightly laced back brace that may have kept him from recoiling to the floor of his car after the assassin’s first bullet struck him in the neck. “The brace was a firmly bound corset, around his hips and lower back and higher up,” said Dr. Thomas Pait, a spinal neurosurgeon who co-authored a paper about Kennedy’s failed back surgeries and other treatments such as manipulation under anesthesia. “He tightly laced it and put a wide Ace bandage around in a figure eight around his trunk. The Kennedy clan closely guarded the true extent of John Kennedy’s medical problems well past his death. Though details escaped over the years. In 2002, historian Robert Dallek was allowed access to a collection of documents spanning 1955 and 1963 and specifics began to emerge. “He was not unlike many Americans who suffer from chronic back pain, in search of solutions to resolve their pain so they can carry on with their lives," Pait said. “It's one reason we have a national crisis in opioids and narcotics: people wanting a solution to their pain." While he was at Harvard Kennedy added a new ailment to a lengthy list of health problems: chronic back pain. It started when he was tackled from the side during a football game. He began regularly using a corset brace to stabilize his spine and control his discomfort. After college, it was that back pain, along with his extensive history of other medical problems, that kept Kennedy from his next dream: serving his country in World War II. First the Army and then the Navy turned him down.But Kennedy didn’t give up, and with the help of his father's political contacts, he was accepted into the Navy in 1941. After coming back to the states, following his infamous war heroics, Kennedy was in a lot of pain. He did what anybody does today. If there is a decline of mobility and intractable pain, he looked for a solution. Pait and Dowdy examined Kennedy's pre- and post-surgical X-rays. Their analysis, made from the viewpoint of spinal surgeons, found no abnormalities in the spaces between vertebrae and no sign of underlying bone disease, which had long been suspected due to Kennedy's use of steroids. Unfortunately, Kennedy never fully recovered from the fusion surgery, developing a staph infection that created an "open, gaping, very sickly looking hole," according to Ted Sorenson, Kennedy's speechwriter. By February of the next year, he was back in the hospital, undergoing surgery to remove the plate; it would be May before he could return to the Senate. Kennedy's next solution was to turn to muscular injections of procaine, a version of lidocaine, a numbing agent that blocks nerve signals to the brain. According to Pait and Dowdy, he would receive “hundreds, if not thousands,” of injections over the next four years, which along with muscle strengthening and use of the corset produced “dramatic" improvement in his back pain. By the end of 1961, concern was so high about the president's use of injections that Rear Adm. George Burkley, who had been White House physician since Eisenhower, took over Kennedy's care. He brought in a new doctor, Dr. Hans Kraus, known today as the father of sports medicine, who established a multidisciplinary pain center in the late 1950s. It was Kraus’ belief that much of his back pain originated in weak and deficient muscles. Kraus put Kennedy on a regimen of weight-lifting, swimming, massage and heat therapy, and began trying to wean the president off the back brace. “Kraus felt that the brace was getting in the way of Kennedy's strengthening exercises," Pait explained. "For example, today we tell people not to sleep in the brace. We try to get people out of the brace as soon as possible because it makes the muscles lazy. 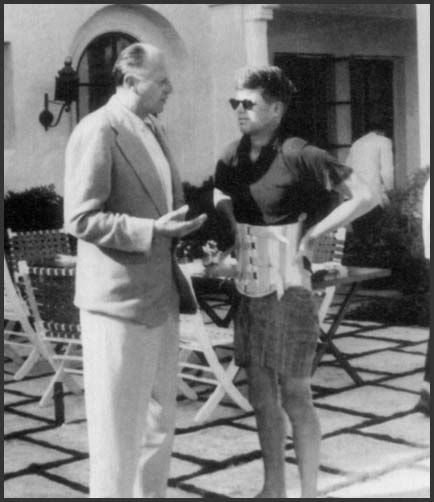 “By this point, Kennedy had been wearing the brace most of his adult life,” he said. Almost immediately, the new approach had "dramatic" benefits, Pait said, and Kennedy was well on his way to recovery from back pain, perhaps for the first time in his life. Then, in August 1963, just a few months before the visit to Dallas, Kennedy strained his back and began relying on the brace again, despite his doctor’s concerns. “Kennedy said to Kraus, ‘Look, I tell you what, when I come back from Dallas, I'll get out of the brace, but I gotta wear it for this trip. I gotta look good.' He wanted to be able to sit up tall and wave at people,” Pait explained. We'll never know if he would have survived if he'd followed the doctor's advice and gotten rid of it.